Narendra Modi name need no introduction. He is most successful chief minister of Gujarat. He is popular because of his leadership, governance and dynamism. He is longest-serving Chief Minister in Gujarat (serving since 6th Oct, 2001). 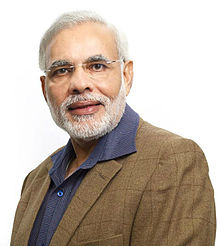 Recently Narendra Modi is projected as prime ministerial candidate of the BJP for upcoming election of 2014. Since then we have seen number of analyst, investment firms are talking about positive moves in stock market. Examples are article by Nomura and Goldman Sachs. No worry sensex forecast is one of the most favourite jobs of experts weather this forecast turn in to reality or not they are least concern. Recent stock bull run is projected because equity investor views BJP as business-friendly and BJP’s prime ministerial candidate narendra modi as agent of change. Explaining the bullish rationale further, it is said Modi has been focused on infrastructure and capital spending in the past and a BJP-led government may be beneficial for the investment demand pickup. Do you really think stock market moves are affected by political changes? Answer is YES, if we look at history than when Manmohan Singh was elected as Prime Minister on 18th May, 2009 in UPA government, Sensex surged to 2110.79 points and trading was halted at upper circuit. As Manmohan singh is economist people belief was that under new government will speed up reforms and give the necessary thrust to boost the sagging economy. Narendra Modi is not economist but he believed as dream reformer and synonyms of excellent leadership and governance. Everyone is aware about “Gujarat Development model” and everyone wants same to be replicated to entire INDIA. “If we want to move ahead in 21st century we need politics of development. The nation needs vikas that’s it”. With expectation of reform and development bullishness in stock market is expected if Narendra Modi wins the election. Current bull-run in market is because of Narendra Modi? Market will surge if BJP wins election and narendra modi becomes prime minister in 2014. Don’t think that recent positive move in stock market is because of narendra modi. The real truth is that currently market is growing because of improvement in business scenario, foreign inflow to Indian equities and US FED has delayed its pull back of quantitative easing program. The effect of modi in stock market will surely reacts positive. India will have more chances of becoming bright. BJP plays a key role in 2014 elections. Well, chances are that either NDA or a hung parliament. A hung parliament may not trigger a surge in the market. well, lets see what happens.